At 85,000 acres, the Fakahatchee State Preserve is Florida's largest and least developed park. The park is made up of diverse, yet interconnected ecosystems including Bald Cypress Swamps, Marl Prairies, Cypress Domes, Hardwood Hammocks, and Salt Marshes. Our work wit the Friends of Fakahatchee began with a sustainability review of proposed work by the Florida Parks Department that included visitor parking and restrooms. Our 12 page report resulted in the State of Florida rethinking their design and giving us control of the elements displayed above. Our guiding principal in the design of theses facilities is MINIMAL IMPACT. The idea must manifest itself not only aesthetically in the finished project but as importantly in the impact during construction. Where possible we eliminate mass, using columns instead of walls. Materials such as steel are used instead of concrete, and lateral forces are handled with diagonal braces instead of massive elements. Precast concrete panels and beams are used only at the floor of the interpretive pavilion as protective strategies against natural fires in the area. All structures will be supported by small helical pilings driven by small machines that are carried into the site by hand. 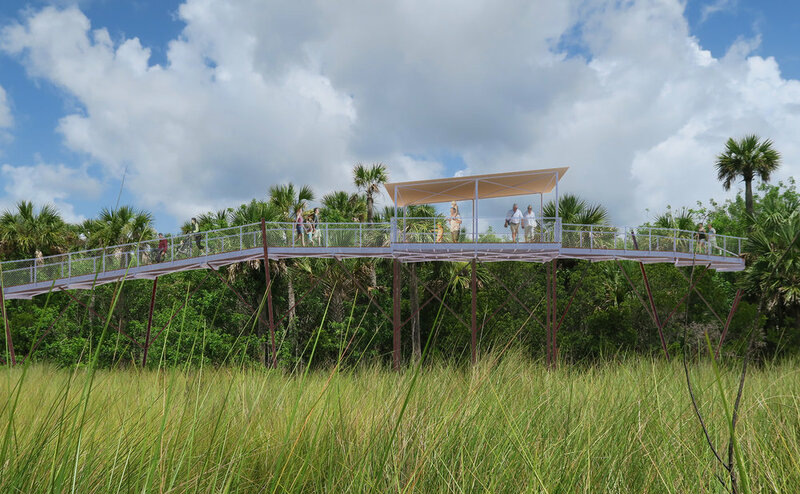 Our enhancements to the State Park include: an Interpretive Pavilion with learning materials and trail maps, a 3,000 foot long, 20 foot high canopy walkway through the cypress forests, a 2,000 foot long lower boardwalk, an Overlook Pavilion on Green Heron Lake, and a Suspended Bridge over the canal connecting the boardwalk to the parking area. The construction will be done in phases, with all of the improvements expected to be complete in 2018.